The thing I'm discovering about my new springtime haircut is that: being a curly haired woman with very short bangs requires a little more attention then just having a bunch of curly, messy hair bouncing around. I may actually have to buy my first hairbrush. It's hard to keep the bangs straight. So this morning when I was grimacing and trying to finger-comb them into something other then a curlicue, I thought, my God! 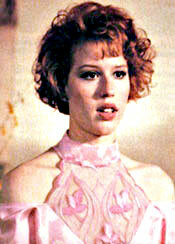 I have the "Pretty In Pink" haircut! May 20 Where's the nurse's office? May 20 "and from your lips she drew the..."